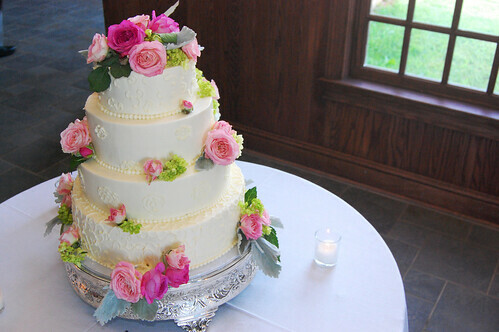 This cake is okay, but ahem ahem I saw a BEAUTIFUL wedding cake on April 24th. Also I saw it on the 23rd, and the 22nd… I was going to send you pictures…but they would have been of me in sweats, batter EVERYWHERE, and exhaustion/anger apparent. The final cake was okay, though. So I don’t even get ONE photo of this masterpiece?? Hey – facebook stalk me. I am not sophisticated enough to download a facebook picture and then send it to you (really). There’s a kinda good but not awesome picture of it that I will tag as you (feel free to de-tag once you’ve been notified).